Introducing the best portable vaporizer ever the Joyetech CuAIO D22 1500mAh Vape Kit Yellow. Being all-in-one style, the Joyetech CuAIO D22 starter kit skillfully integrates a 1500mAh built-in battery and a 3.5ml/2.0ml atomizer into one solid vape pen. Introducing the best portable vaporizer ever. Being all-in-one style, the Joyetech CuAIO D22 starter kit skillfully integrates a 1500mAh built-in battery and a 3.5ml/2.0ml atomizer into one solid vape pen. It has a flip to open filling system and precision top airflow control. Being child-proof, close the airflow first then you're able to open the top cap to refill the eliquid. Having the new ProC-BF series atomizer head, it provides a more restricted draw for mouth to lung vapers and a pretty soft flavorful vaping clouds. 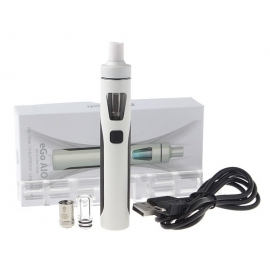 Sleek and small vape pen: Being the most portable vaporizer, Joyetech CuAIO starter kit comes in a quite small size, much convenient and comfortable to carry and vape. Dual child lock system to ensure security: Firstly, rotate the airflow ring to close the air-inlet and make sure the two marks match exactly. Secondly, aim at the arrow, push and pull then you can open the top cap. Convenient e-liquid filling system: After you open up the top cap, inject the e-liquid into the side holes directly, which is simple and convenient. The new ProC-BF (0.6ohm) head made of pure cotton was especially designed for mouth to lung vapors. It produces a soft and purely flavored vapor. 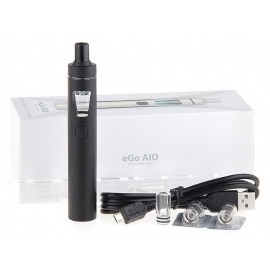 Meanwhile, it is also compatible with CUBIS series/eGo AIO series/eVic AIO/Elitar Pipe. Dual circuit protection: Joyetech CuAIO applies two sets of battery protection circuit system, realizing overall battery protection of over-charging, over-current and over-discharging, which makes it more Advanced and reliable. Adjustable top airflow control: The airflow control was placed on top. Simply rotate the airflow ring clockwise or counter-clockwise to adjust the air-inlet.